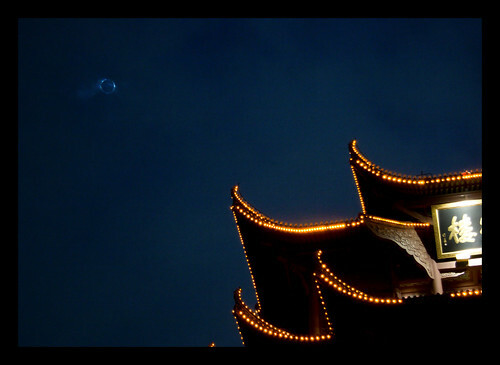 I spent a frantic few days in Shanghai trying to find where and when the tropical storm was going to hit the city. Two things quickly became clear: one was that the weather websites hadn't predicted a single day correctly in the previous two weeks, and the second was that the skies of Shanghai sure seemed to be clouding up fast. Searching for satellite data, other eclipse hunter's predictions and any weather website I could get my hands on it seemed that the best bet was going to be to head West to Wuhan. Wuhan sits around 1000 km to the West but luckily the transport system in China is remarkably good. Catching the train on the afternoon the day before the eclipse gave me not only a pretty comfortable five hour ride to the city, but also the chance to meet some fellow eclipse hunters. John, from Germany, stuck out from the crowd with bags bulging with camera equipment, videos, filters and tripods, making my single camera and solar filter rigged up from a Pringles packet look somewhat ridiculous (I did at least have a Manfrotto tripod to give me a little more credibility). John was travelling with May, who works in Shanghai but is originally from Wuhan. 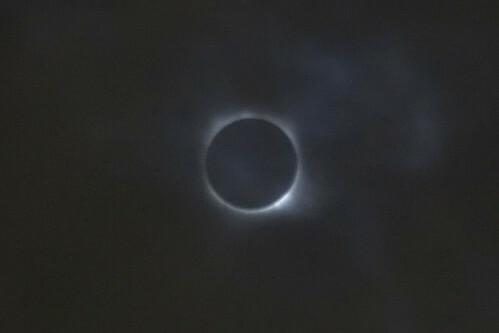 In addition were a couple of American TV producers who were in the country for a week or so hunting for this, the longest eclipse of the 21st century. 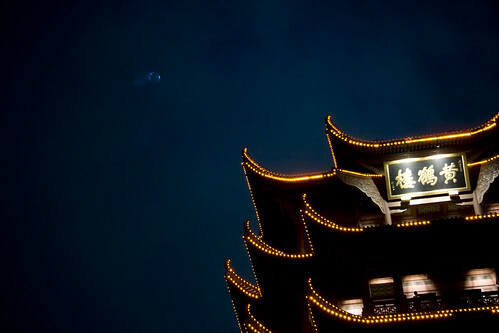 We got into Wuhan and all made our way to a hotel right next to Huang He Lou, the yellow crane tower, and what I thought would be a good spot to see the eclipse from. Getting a bite to eat the night before in an outdoor food market gave me a chance to indulge in some stinky tofu and an excellent dish of spicy pork before heading to bed. I hadn't slept more than a couple of hours the night before, worrying about where I could see the eclipse from, and that night too I couldn't sleep for the expectation of what we may see the next day. Arriving into Wuhan the skies were clear and at night the stars came out, or at least attempted to poke through the light pollution of the city of ten million. So, a little bleary eyed, but very excited we met at 6.30 the next morning to get ourselves ready for the event with plenty of time to find a position and set up shop. 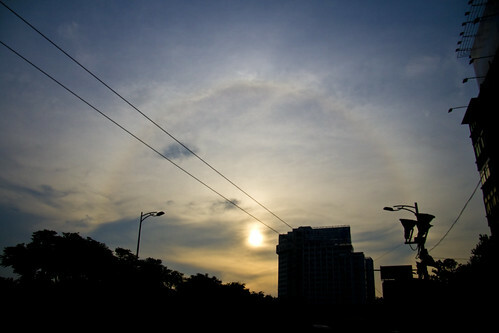 Walking out of the hotel I looked up to the sun and was greeted by a wonderful morning solar halo, a fine view indeed, but a sure sign of some cirrus clouds joining us for the show. We walked up to the temple and found a large crowd, equipped with eclipse glasses who had had the same idea. At 7.30 we were all let in and rushed around to vie for the best spots. John, the seasoned eclipse hunter discovered the best place and we set up our equipment, waiting for the first signs of occlusion. While setting up my kit I was greeted by a never ending stream of reporters, keen to chat to the only Chinese speaking foreigner and I was asked the same dozen question for an equal number of newspapers. At one point I was also interviewed for TV but sadly shied away from giving the interview in Chinese. As the time grew closer, the clouds moved in and it was clear that we were not going to have an easy ride. Indeed as we approached the moments before totality the clouds thickened and we were left with only a few glimpses through the patchy cloud of totality itself. I managed a few photos of the sun as the moon gradually moved across the face but it turned out to be very hard to find the sun with a zoom lens and a strong solar filter when the sun is partially blocked by clouds. The solar filter is so strong that only an unobscured sun is clearly visible. Still, I got a few shots and these were perhaps the best couple. For totality itself the crowds around cheered as the sky darkened completely, lit only by the horizon where totality was not apparent. 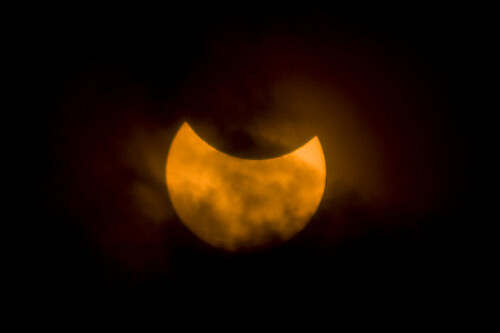 They seemed happy enough with the darkness and were not sad at the lack of the spectacular corona. I did my best and got a couple of shots with the zoom before changing lenses and taking in some wider angle shots to include the temple itself. I have a series of 20 or so shots which I will make into an animation as soon as possible. 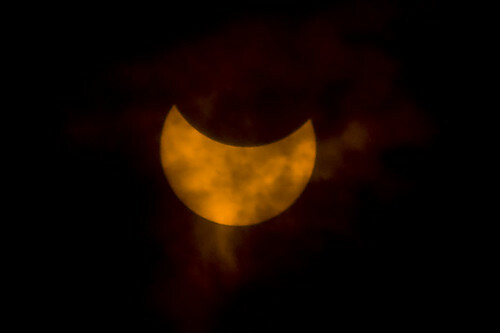 In the mean time, here are my efforts from the moments of totality, clouds included. These were from the clearest ten seconds or so of the five minute totality. It was a strange mix of excitement and disappointment, mixed with not a little amusement, knowing that I'm probably one of the few people in the world who has seen three cloudy solar eclipses in a row. I will of course keep on hunting, and though I may not make it to the next showing in the Easter Islands, I'll be on the case before too long.